Two studies show that breast-conserving surgery plus radiation may be a better option than mastectomy plus reconstruction for women with early-stage breast cancer because it reduces complications, improves long-term survival and costs less. In a study presented Dec. 10 at the San Antonio Breast Cancer Symposium, researchers assessed the complications that arose from various guideline-concordant treatments for early-stage breast cancer, the costs of such complications, and total costs. In another study presented on the same day, researchers compared long-term survival outcomes in women who had breast-conserving surgery with those who had mastectomy. A team of researchers from The University of Texas MD Anderson Cancer Center compared complications and costs of, the following guideline-concordant local therapy options for women with early-stage breast cancer: lumpectomy plus whole breast irradiation (lump+WBI, also referred to as breast-conserving therapy or BCT), lumpectomy plus brachytherapy (lump+brachy), mastectomy without reconstruction or radiation (mast alone), mastectomy with reconstruction without radiation (mast+recon), and lumpectomy without radiation (lump alone). 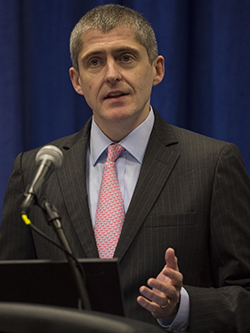 Benjamin D. Smith, MD, speaks during a press conference at the 2015 San Antonio Breast Cancer Sympsosium. Photo by © MedMeetingImages/Todd Buchanan 2015. “Although there’s nuance as far as what treatment is best for which patient, there is a large group of patients for whom most, if not all, of these treatment options are considered guideline-appropriate,” says Benjamin D. Smith, MD, associate professor and research director of the breast radiation oncology section at MD Anderson, who presented the study. Currently there is no framework to help patients understand the experience they would have with mastectomy and reconstruction compared with lumpectomy and whole-breast irradiation, and the trade-offs between these two treatments in terms of side effects, costs to the patient, and costs to their insurance company, Smith explains. “To me, it seemed like a black box,” he says. To gather information on treatment costs, the researchers used two data sources: the MarketScan database, a commercially available database on insurance claims from employers that they used to gather data on younger women, and the SEER-Medicare database, which they used to collect data on older women. Using diagnosis and procedure codes, the researchers tracked complications that occurred within two years of diagnosis—including wound, local infection, seroma or hematoma, fat necrosis, breast pain, pneumonitis, rib fracture, graft failure, and implant removal. Complication-related costs and total costs were calculated. For younger women from the MarketScan cohort of 44,344 patients, the risk of complications from lump+WBI was 30 percent, versus 56 percent for mast+recon. The risks were 45 and 25 percent for lump+brachy and for mast alone, respectively. For older women from the SEER-Medicare cohort of 60,867 patients, the risk of complications was 38 percent for lump+WBI, 51 percent for lump+brachy, 37 percent for mast alone, 69 percent for mast+recon, and 31 percent for lump alone. Compared with lump+WBI, complication-related costs were $8,608 higher with mast+recon for younger women with private insurance and $2,568 higher for older women with Medicare. The most expensive therapy (procedure cost plus complication costs) for younger women was mast+recon, with an average cost of $89,140, which was $23,421 more than lump+WBI. For Medicare patients, lump+brachy and mast+recon were the two most expensive therapies, costing $37,741 and $36,166, respectively, while lump+WBI cost $34,097. “When oncologists offer all appropriate therapy options to patients, some women may choose to avoid radiation and opt for mastectomy and reconstruction instead. This study is helpful to such patients because it provides them with information regarding the trade-offs involved in this choice,” he says. “Our study findings are also particularly relevant from a payer’s perspective, given the growing emphasis placed on promoting treatments that are effective, safe, and cost-conscious,” he adds. In another presentation, Sabine Siesling, PhD, senior researcher at the Netherlands Comprehensive Cancer Organisation, Utrecht, the Netherlands, and professor at the University of Twente, Enschede, the Netherlands, emphasizes the importance of comparing survival outcomes from breast-conserving therapy (breast breast-conserving surgery followed by radiation therapy, BCT) versus mastectomy without radiation therapy. 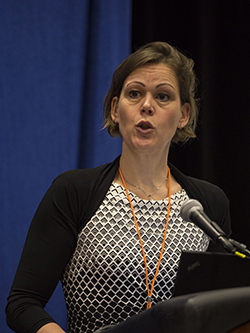 Sabine Siesling, PhD, speaks during a press conference at the 2015 San Antonio Breast Cancer Symposium. Photo by © MedMeetingImages/Todd Buchanan 2015. Such information “could help support the shared decision-making process and improve the quality of breast cancer care,” Siesling says. Siesling and colleagues used data from the Netherlands Cancer Registry on 37,207 women diagnosed with early-stage breast cancer between 2000 and 2004, to estimate 10-year overall survival (OS), and data from a subcohort of 7,552 patients with similar characteristics diagnosed in 2003, to estimate 10-year disease-free survival (DFS). About 58 percent and 62 percent of the patients from the total cohort and subcohort, respectively, received BCT, and the rest of them received mastectomy. After adjusting for confounding factors, the researchers found that those who received BCT were 21 percent more likely to be alive after 10 years than those who received mastectomy. There was, however, no significant difference in DFS between those receiving BCT and those receiving mastectomy. The results were similar in all subgroup analyses, including tumor stage and lymph nodal status. Analyses of data from the subcohort also showed that the patients who received BCT developed regional recurrences and distant metastases less often than those who received mastectomy. “We suggest that BCT should be the treatment of choice, especially in T1N0 [small tumors up to 2 cm, with no nodal involvement] stage breast cancer when it is medically feasible and according to the patient’s wish,” Siesling says. These two studies suggest that for early-stage breast cancer, breast-conserving surgery has fewer complications, is cheaper, and has better outcomes than mastectomy. Judy Johnson, a 12-year breast cancer survivor and an active breast cancer research advocate from St. Louis, feels that the study on the costs and complications from local therapies highlights the volume of complications and burden to patients and insurance companies. Johnson says she is very disturbed that the rates of mastectomy are rising among women with early-stage breast cancer even as evidence is indicating greater benefit with breast-conserving surgery. “It is unfortunate that some women with DCIS choose mastectomy even when there is no indication,” she says, adding, while many of these decisions are influenced by fear and misperceptions, patients’ social circles may play a role too. Johnson, who is a co-chairperson of the Komen St. Louis Affiliate’s Research Advocacy Committee, says attending the symposium strengthens her understanding of the science of breast cancer, which helps her effectively present the patient viewpoint to breast cancer researchers with whom she collaborates. She has been involved in the national peer review process for Susan G. Komen and the Department of Defense Congressionally Directed Medical Research Program. “Scientists and clinicians need to have active involvement of patient advocates during the time that they are creating concepts, designing clinical trials, treating patients and presenting research results to the public,” she says. Thank you for your insightful summary of the SABCS. Once again I must note that lymphedema, a sequela of breast cancer treatment, is neglected in studies of treatment alternatives. Dr. Smith’s study of surgical complications of breast cancer treatment alternatives utilized diagnosis or procedure code within two years for any of the following: wound complication; local infection; seroma or hematoma; fat necrosis; breast pain; pneumonitis; rib fracture; implant removal or graft failure. While nicely constraining the study, it neglects significant differences in long term complications of lymphedema between the treatment alternatives, which affects some 25% of the patients, is frequently undiagnosed and undertreated, and which may not present clinically for years after breast cancer treatment is completed. Likewise, Dr. Smith’s ranking of the two-year costs of the alternatives neglects the not insignificant two-year increased costs of treatment of those survivors who develop lymphedema [Shih 2009]. When these costs are considered, they could reverse Dr. Smith’s cost preference conclusions of lumpectomy + WBI over mastectomy + reconstruction.